In 1999, Tony Stewart set a new standard for rookie drivers in NASCAR's Winston Cup. In 2000, the stakes were a notch higher and there was even more pressure to win. Has Stewart fallen victim to the sophomore jinx, or is he on the road to establishing himself as one of NASCAR's elite drivers? Perhaps this year it has been a little of both. Tony Stewart has proven to the world that he can win at any racing venue. Working his way up through the USAC Midget series, he got his first taste of NASCAR as a part-time driver in the Busch Series during the mid-1990's. His future stock car racing career then took a temporary detour through the IRL because of sponsorship problems. Open-wheel racing didn't seem to pose a problem for Stewart, because in 1996 he won the IRL Rookie of the Year, and in 1997 he won the coveted IRL Championship. As he was rising to the top in the IRL, the Winston Cup world took notice. In 1999, he was asked to drive for Joe Gibb's team under the Home Depot sponsorship. The Indiana native's career was back on track and his dream of becoming a Winston Cup driver had become a reality. Right out of the gate, Tony managed to obtain the outside pole at Daytona. His finishing position of 28th was less than spectacular, but his rookie season was just beginning to gain momentum. He garnered two top-ten finishes at Darlington and Texas, followed by two more at Talladega and Fontana. He then proceeded to win The Winston No Bull 25 and The Winston Open, followed by a 2nd place finish in The Winston. If anyone hadn't heard of Stewart by now, they certainly were standing up and taking notice. It was at this point that Stewart's sensational rookie season caught fire. In the next 16 races, he only finished out of the top-ten on two occasions. He completed the year by winning back to back races at Phoenix and Homestead, giving him three wins for his rookie season and finishing fourth in the championship points race. His consistency was remarkable as he finished every single race. At Michigan, bad pit strategy by the team caused him to run out of gas, but he still limped to the finish line in 9th place! How amazing was this accomplishment? Jeff Gordon didn't come close to these rookie achievements. Dale Earnhardt finished seventh in his first full season while accumulating only one win. Jeff Burton finished 24th, Rusty Wallace 14th, and Ricky Rudd ended up in 17th place during their rookie years. In 1960, Richard Petty competed in 40 races and won three of them in his first full year. But he had already raced in 24 events over the previous two years without a win. No one had ever burst on to the Winston Cup scene like Tony Stewart. With all the hoopla surrounding the best rookie season in Winston Cup competition, what lay ahead for Stewart in his second year? His sophomore year might best be described as a mixed bag. It has had some tremendous highs, and some other lows he'd soon like to forget about. 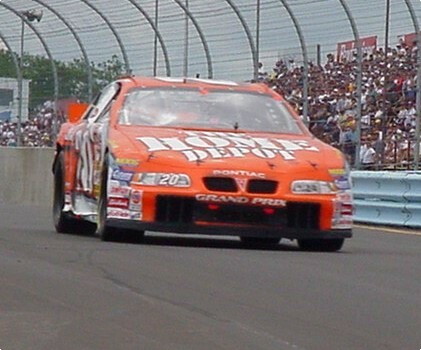 First on the list of lows for the year 2000 is the inconsistency that has plagued the #20 Home Depot Pontiac. Whereas consistency powered Tony to a fourth place finish in 1999, his race results this year have varied significantly from week to week. He has finished 25th place or lower in six races this year. There have been four DNF's, with three of them resulting from accidents. 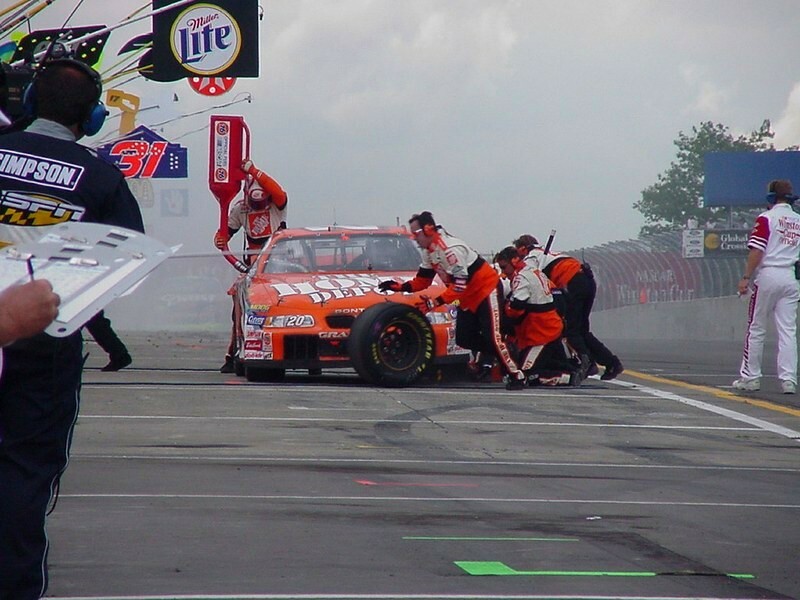 It was an accident at Watkins Glen that precipitated perhaps the low point of his year. While trying to gain position, Stewart sideswiped Jeff Gordon early on, and the two had a heated discussion in the garage after the race. Knowing that the accident was Stewart's fault, Gordon was very irate about the incident that severely damaged his car. It was the first time most people heard the usually calm Gordon use profanity. This altercation, along with others, did not help Stewart win any popularity contests with his fellow drivers. As with most things, you can see the glass as being half-empty or half-full. For Stewart fans, the 2000 campaign was full of positives. He currently sits in sixth place in the standings. With great performances over the last three weeks and a little luck, Tony could move up as high as fourth place, just like his rookie season. He has the most trips to victory lane this year with five, including once again obtaining back-to-back wins. He is on a pace to top $3 million in earnings for the second year in a row. And his position with Joe Gibbs and the Home Depot team seems quite secure. The race at Rockingham was almost a microcosm of Stewart's year. With 33 laps to go in the Pop Secret 400, Stewart had just made a second pit stop to tighten some loose lug nuts, sat in 18th and was merely hoping to make up a few positions to lessen the disappointment. But as the green flag dropped for the final shootout, Stewart knifed through car after car on his way to the front. When the race ended, Stewart had scored another top 10 in the form of a seventh. "Considering the problems we had at the end there -- you can't be too disappointed to restart 18th and come back to pass 11 cars in the last 35 laps," said Stewart. "The best part about it and the best part for us leaving here is that we had the fastest car that last 35 laps." Expectations were certainly high for Stewart in 2000 because of his record-breaking rookie year in Winston Cup competition. Some will say he has not been successful because he didn't perform as well as his rookie year. Others will say he succeeded in beating out all but five drivers this year. How you perceive his sophomore year probably depends on whether or not you are a Tony Stewart fan, and whether you view the glass as half empty or half full.